No. - no trying there: I did buy some Kool-aid on ebay, but it got confiscated by customs for now. Have to sort this problem out later. In the meantime I have to use what's available. 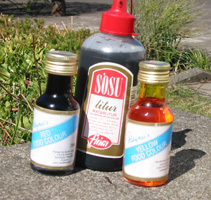 The picture shows Reyner's food colour, a British product, and sósulitur, an Icelandic product to colour gravy or more enhance its colour to a dark yummy brown. I only used the Reyner's but wanted to show you what's available round here. The plan was to have stripes in yellow, orange and red, whereby orange was meant to be the main colour. I mixed three Sisu-glasses (isn't it a crime that IKEA stopped selling those!?) 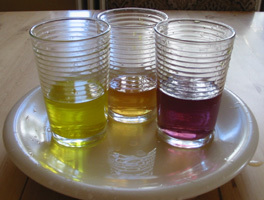 with water, vinegar and food colour. Each three table spoons for red and yellow pure and 2:1 yellow to red for the orange. 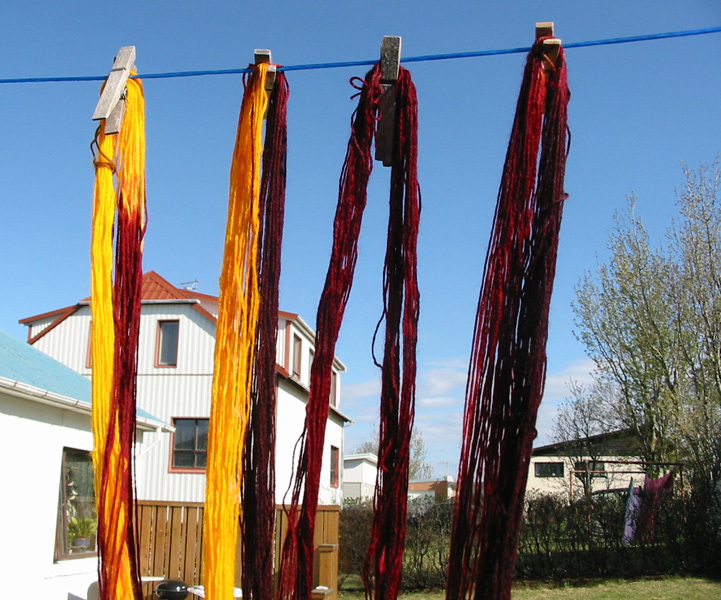 I soaked the skein in in vinegar water before this time. Then everything went into the microwave (2 min zip, 2 min rest) 3x. 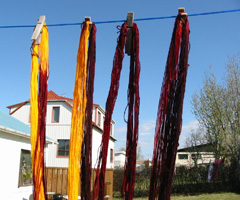 The dye liquid did not clear completely and I washed and rinsed the yarn for about 15 minutes. 15 minutes without making any progress concerning the colour bleeding. Is this normal? I gave up for this time because I was so curious how it would look like when dry. Well... The yellow is fine. The red and orange is not, simply because they are not there. So, the final result does not look at all like intended (red-orange-yellow stripes) but is nice anyway. 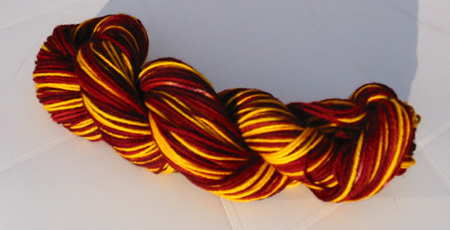 Does it reminds you of the Gryffindor house colours, too? by Carola at 6:28 e.h.
LOVE LOVE LOVE the yarn@!!! maí 22, 2006 5:31 e.h.
maí 22, 2006 5:55 e.h.
Beautiful! And if you're ever looking for koolaid again, let me know, I'd be happy to send some your way. maí 22, 2006 6:41 e.h.
maí 22, 2006 7:04 e.h. Very HP-like! Even if it's not what you were going for, hopefully you like it. maí 22, 2006 7:17 e.h.
maí 22, 2006 9:49 e.h.
That is some great HP Griffindor yarn. Maybe not what you were going for but a very nice surprise!! Maybe if we all put a package of KoolAid in a letter to you it would not get opened by customs??? I for one would be willing to try. One package may not draw attention in a letter size envelope. maí 23, 2006 4:10 f.h. maí 24, 2006 11:59 f.h. I'm comming to Iceland in 10 days. Do you want me to bring some kool aid? You can send me an email, sonja @ richter dot org. maí 26, 2006 7:03 e.h.
Oooo, I like it! It's a bit difficult to see the colors accurately on the monitor - so how did the sósulitur come out? Is it brownish or? I'll be sure to buy some sósulitur when I'm in Iceland next week! júní 12, 2006 10:39 f.h. Unintended outcomes are often the best! The yarn is fabulous. maí 16, 2007 1:56 f.h.